The Ourlife Kids Waterproof Camera is a decent starter kit for kids interested in photography and videography. While the video and photo quality certainly aren’t winning any awards, there is plenty to learn and discover for a fairly low price. The Ourlife Kids Waterproof Camera comes already encased in its waterproof housing. While you’ll need to remove this to gain access to the memory card slot (on the left side of the device) or the USB port for charging and file transfer (on the right), you can keep it on for all other operation of the camera, as the waterproof casing still gives you access to all of the six buttons on the device. On the top, you’ll find photo and video buttons, and on the rear of the device below the LCD monitor, you’ll see Left, Power, OK, and Right buttons, in that order. The camera itself is small and light, and perhaps a bit flimsy feeling, but put it in the waterproof housing and it feels pretty much bulletproof. We imagine this is how the company imagined buyers would be using the camera most of the time. The buttons require a decent amount of force to press when behind the casing, which is something to note for younger children. The best part of the Ourlife Kids Waterproof Camera design is really in the accessories. In this tiny package, they’ve managed to include everything you need to mount the camera on a helmet, handlebars on a bicycle, or any standard tripod mount (which also makes it mountable on a selfie stick). The makers of the Ourlife Kids Waterproof Camera were clearly aiming to provide buyers with everything they need to get started right in the box. No shopping for batteries, forgetting to buy a memory card, or realizing you need additional mounting hardware or waterproof casing to realize the full use of the product. You’ll want to remove the camera from the waterproof housing when you first receive it so you can charge the battery and start using it right away. But in terms of setup, that’s about it. If you’d like to mount the camera to a helmet or a bike’s handlebars right away you can opt to set those up, but with the simple design, you won’t need to budget more than a couple minutes for this task. The user manual is also an area where we have to give praise to Ourlife — although some of the instructions are perhaps not the greatest English translation, they kept the manual itself to an extremely concise 15 pages in a tiny booklet, as opposed to the usual car-manual-sized information packets that come with most cameras. Everything is laid out in dead simple terms with plenty of visual accompaniment to answer any common question without much fuss. Users should take a moment to familiarize themselves with the functionality of the buttons and the menu systems however, because one of the notable shortcomings of this device is its somewhat unintuitive and quirky operation. For example, pressing the photo or video button doesn’t take a photo or start recording a video unless you are already in that mode. So if you were just taking a video and wish to take a still photo, you tap the photo button twice, once to switch modes and once to take a photo. When it comes time to take photos, it comes up quite short. Finding playback mode to review your content is similarly confusing. While already in the photo or video mode, tap the power button to enter a menu system containing four icons: a camera (which exists this menu back into camera mode), a play icon (which actually brings up playback), a video camera (which exists this menu back into video mode), and a gear icon (to open the options menu). It’s not very clear which item does what until you click on them, and the fact that the play mode icon looks like a big right arrow doesn’t really help. This is where our praise for the Ourlife Kids Waterproof Camera reaches the end of the road. There are many great things to be said about this camera, but when it comes time to take photos, it comes up quite short. A 5-megapixel maximum resolution puts this camera in line with a circa 2006 GoPro, and that’s about where the quality nets out as well. Photos are of very low detail and suffer from a lot of image noise. Additionally, the camera had a tough time finding the right white balance for half of the scenes we tested it in, often giving images a very pronounced green cast. Users should probably try to avoid using the camera indoors or at night time, because poor low light performance means you won’t get very desirable results. Outdoors, during daylight conditions, the camera fares significantly better, although still nothing worth writing home about. If taking share-worthy photos is high on your list of musts for a camera, you might need to keep looking. Predictably, the biggest shortcomings of this camera are the image sensor quality (which caps out at 5 megapixels) and the 1.77-inch rear LCD screen — two of the most expensive elements in any camera body and impossible to completely skirt around. Image quality won’t even live up to budget smartphone performance, and the rear screen will do your photos and videos an even further injustice until you can transfer them to another device. This shouldn’t be too great of a surprise given the price point, but just be aware of this fact going in. All of this is unfortunate, but it isn’t shocking. You can only expect so much from a cheap action camera that contains a full suite of accessories and a memory card to boot. Ourlife gives a very comprehensive out-of-box solution with no additional shopping necessary, but not without sacrifices. Videos suffer a similar fate to photos with the Ourlife Kids Waterproof Camera. You’ll still get the best results outdoors in ample lighting conditions, and want to avoid taking videos indoors or in low light scenarios if at all possible. Perhaps it was just our imagination, but we actually found video quality to be slightly more favorable than still image quality in the same setting, when typically the reverse is true. This is certainly worth noting, since action cameras such as this are definitely geared more towards video use. There was one very strange surprise with the video, however. Despite an advertised maximum video resolution of 1280 x 720 (HD), there was an option to record in 1920 x 1080 (FHD). This is extremely unusual for a camera like this. Why would you want to sell yourself short on one of the marquee features of your device? Figuring this might be a mistake, we took a few sample video clips and imported them onto a laptop to check the official clip specs. Sure enough, the camera actually can record video at 1920 x 1080. Upon further inspection though, we realized it can only do so at a maximum of 15 frames per second, well below the minimal acceptable frame rate of 24 fps used for any video applications. So our excitement was somewhat short-lived, not that it would have made a world of difference either way, since the baseline video quality is not high enough to be begging for more pixels. There is no additional software associated with the operation or use of the camera. When you’re ready to either charge the camera or take your photos and videos off of it, simply connect the provided USB cable to your computer and transfer them as you would any other USB storage device. When taking photos, Ourlife gives users six frames (think decorative, static borders) that can be placed around pictures. These include Christmas, alphabet, and bunny-themed frames, as well as a few less thematic choices, like a gold border with stars, a winged “I LOVE YOU” heart, and a rainbow. Similarly, with videos, you can choose from six filters that can be applied during video capture, including blue, green, red, inverted, sepia, and black and white. A very low-cost option for people looking to introduce kids to the world of photography and videography. The Ourlife Kids Waterproof Camera comes in at retail price that's usually around $40, making it a very low cost option for people looking to introduce kids to the world of photography and videography. Few similar products in our search offered quite as comprehensive a suite of accessories to complement camera, and this makes a big difference for those wanting to get everything they need to get going out of the gate. After all, nobody likes to receive a gift that requires extras that aren’t included in the box. Another camera featured in our roundup of best kid-friendly cameras was the VTech Kidizoom Duo Selfie Camera. However, the Ourlife Kids Waterproof Camera actually offers more video and photo resolution and more accessories at a lower price. The VTech is certainly more of an explicitly kids-only camera with a design to match. Children under five might have an easier time handling the VTech, and the button layout and design is certainly designed to be more toddler-friendly. Ultimately though, the Ourlife will probably provide more use in the long run, as kids will outgrow the VTech Kidizoom a lot quicker. Check out our other reviews of the best kid-friendly cameras and best video cameras under $100. A good starting point for any child with photo ambitions. 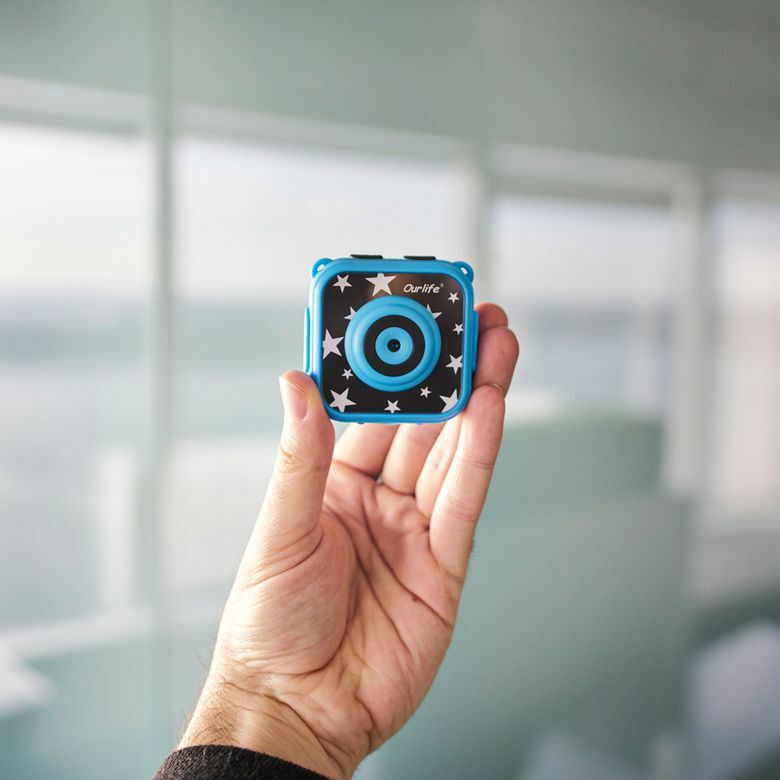 The Ourlife Kids Waterproof Camera is neither expensive nor fragile, and therefore a pretty easy recommendation for those looking to introduce kids to the world of photography. Photo and video quality are definitely lacking, but overall we still felt that the camera delivers enough value at $39.99 to be worthy of serious consideration. Product Dimensions 2.3 x 2.3 x 1 in.